Cuisines Nuenza is thrilled to announce that we now offer a brand new, revolutionary product from DuPont™ Corian® that takes your kitchen renovation into cutting technology. The DuPont™ Corian® Charging Surface charges your mobile devices without cords, simply place the device over the charging surface. What Is the Corian® Charging Surface? The Corian® Charging Surface is a new technology that easily charges mobile devices, such as smartphones and tablets, without the use of cords or plugs. The Corian® Charging Surface allows you to wirelessly charge your device on the “charging spot” directly on your countertop. That’s right, no more wires cluttering your counter space! How Does the Corian® Charging Surface Work? In order to charge mobile devices wirelessly, the Corian® Charging Surface uses a transmitter hidden just below the counter surface to safely transfer wireless energy to a receiver within. Some smart devices are already enabled with wireless charging capabilities; however, for those that are not, simply plug in the charging ring from Duracell® Powermat® into your device, and place it over the charging surface. Charging stops automatically when your battery is full. For your next kitchen renovation project, revamp AND update up your living space! 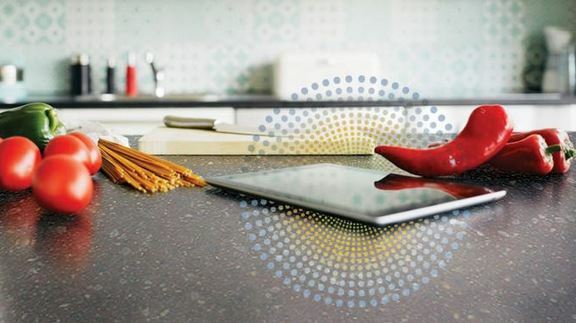 The Corian® Charging Surface is the perfect mix of design and technology for your home. The charging surface is available in all Corian® and Zodiaq® colours. The Corian® Charging Surface can be installed on any surfaces you use such as kitchen countertops, breakfast nooks, dining areas, bathrooms and even offices. This new technology is essential for those with busy lifestyles, seeking simplicity and convenience in their lifestyles design; no need to search the house for the right charger or to find a an available plug – just set your device down on your sleek surface. It doesn’t get more convenient or stylish than that! The Corian® Charging Surface isn’t just for the home; it’s also an innovative technology for businesses. Giving customers the option to charge their smartphones or tablets encourages customers to stay longer, buy more, and have more memorable and enjoyable experiences in your place of business. It’s also likely to increase customer loyalty, as you are offering a service that your competitors are not. Offer the charging surface to your employees. Install it on workstations or in your lunchroom; it’s a great added service for employees. Whether for your home or your business, it’s time to consider the Corian® Charging Surface for your next kitchen renovation project. The new wireless technology is essential for a sleek and cutting edge custom kitchen or bathroom design. Want to learn more about the technology and how we can integrate it into your home? Contact us today or come visit us at our Montreal kitchen showroom on Saint‐Laurent Boulevard in the fashionable Mile Ex district.